The Ravishing Miss Burke has everything a young lady could want–beauty, status and suitors lined up just to beg for her hand. Until a blackmailer from her past holds her future for ransom. 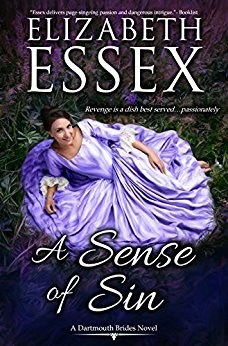 Colonel Rupert Delacorte, Viscount Darling will go to any length to ruin the woman responsible for his beloved sister’s death. But the Ravishing Miss Burke is nothing like the icy murderer of his waking dreams–she’s nothing but a bluestocking with a shocking secret she’ll go to almost any length to keep. Even succumbing to his sinful seduction. Have a fan ready because the steam comes off the pages. I loved this one from the start because you quickly get to his plan and find a mystery. The attraction between them is very strong, but they won’t touch each other or it will explode. They are a different kind of couple that love to tease and drive each other nuts. When it came to the blackmailing I could not figure out who until near the end and then didn’t expect the why at all or what happened. A favorite scene involved guys and what was said that made me laugh. Celia is nothing like you would expect. She doesn’t care for the balls or the lavish lifestyle, she is more at home in the country doing her work. I loved her as soon as she started saying what was on her mind and shocking her mother. She is super sweet and friendly. Del definitely lives up to his reputation. He set out to ruin her and get to the bottom of his sister’s death, but his heart had other plans. I loved that he was very straight forward with what he said and didn’t hide. He can shock you and charm you with his words very easily. Like the first book, this one is amazing! Check out A Sense of Sin here. Guest review contributed by The Sassy Book Lover. This blogger is a sassy, book-loving southern belle. She posts reviews mainly but also about her own writing journey and encourages readers to be modern-day bluestockings.